Bengali brides that stole our hearts with their stunning wedding looks! If you are going to be a Bengali bride and are looking for some inspiration for your Bengali bridal look then you have come at the absolute right place. 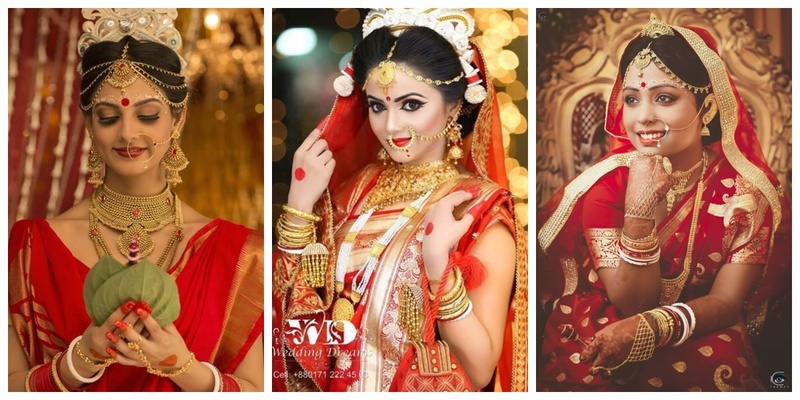 To give you major Bengali bridal look inspiration, I have curated a list of Bengali brides, who looked gorgeous on their big day. Bengali wedding makeup generally has big and bold eyes with shimmery eyeshadows and big kohl-lined eyes. The chandan design over the brows only adds to the beauty! Bengali brides usually wear all-gold jewellery, while the highlight being a mathapatti and small gold crown. They also generally wear two necklaces and white and red bangles along with gold ones. If you are not the one to wear bold eyes and heavy makeup, then a simple eye makeup with red pout is something that you can definitely consider opting for your Bengali bridal look. A traditional Bengali bride is supposed to wear red on her wedding day. Most bengali brides prefer to wear a red Banarasi saree embellished with gold details or embroidery to match the gold jewellery. The traditional Bengali bridal look comprises of a beautiful red Banarasi saree, alta on the hands and feet, mathapatti, necklaces, mukut and red and white bangles with gold. Doesn’t this bride look absolutely ethereal in her traditional Bengali bridal look? Big shimmery eyes are a great way to get your Bengali wedding makeup done. For jewellery, you can wear a traditional chik or gold choker and a gold tikli, which is popularly known as the maang tikka! While Bengali brides traditionally wear red on their wedding day, modern day brides have started to choose other colours too. You too can pick a bright and vibrant colour like pink, green or blue to wear with your Bengali bridal look! This beautiful Bengali bride has a totally traditional bridal look, which is replete with Bengali bridal jewellery like the nath, paati haar, chik, mathapatti and tiara. Don't these Bengali brides look radiant in her flawless Bengali wedding makeup? There’s no way I am forgetting what a goddess Bipasha looked on her wedding. Her Bengali bridal look was much more modern as she chose to wear a red Sabyasachi lehenga with beautiful Kundan jewellery. However, I totally loved how she kept her Bengali bridal look intact by using chandan over the brows and wearing the traditional Bengali bridal mukut! Which of these Bengali brides inspired you the most to create the perfect Bengali bridal look for your big day?